Image caption Barton: 'Organ donation week has been politicised by the use of Free Derry Corner'. Ulster Unionist MLA Rosemary Barton has called the Western Trust "abhorrent" for painting the Free Derry Corner mural pink for Organ Donation Week. Mrs Barton slammed the Trust on Twitter for using what she called "an overt Irish Republican symbol and location" to promote organ donation. The trust has "apologised if this has caused any offence" to Mrs Barton. Free Derry Corner was one of a number of landmarks turned pink for Organ Donation Week. Mrs Barton said the painting of Free Derry Corner was brought to her attention when several of her constituents called her to express their distress. 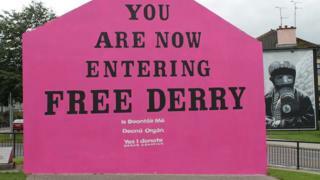 Free Derry Corner is a freestanding wall, the last remaining gable end of terraced houses, with the words "You Are Now Entering Free Derry" painted on the wall. The slogan was painted on the wall in the late 1960s to signpost to the nationalist Bogside area of the city. The mural has been painted several times over the years to promote different causes and charities. Image caption "You Are Now Entering Free Derry" was first painted on the gable end of a row of terraced houses in the late 1960s. Speaking to BBC News NI, Mrs Barton said: "Organ Donation Week has been politicised by the use of Free Derry Corner. "It's a significant political symbol and it's used by violent republican terror groups. Its use by the Western Trust could cause upset to victims of republican violence. "There are many other sites that could have been used that don't cause stress or hurt to anyone." Several landmarks across the Western Trust area were turned pink for the week including the Guildhall Clock, the Strule Arts Centre in Omagh and Enniskillen Castle. Mrs Barton asked the trust to remove a post on their social media pages that asked followers to "stop and take a snap" at Free Derry Corner and share the pictures to promote Organ Donation Week. The Western Health Trust confirmed that they "spoken directly" with Mrs Barton and had "explained the wider objectives of the campaign and have apologised if this has caused any offence". National Organ Donation week runs from 3-9 September 2018 across the UK with the purpose of raising awareness about organ donation and to encourage people to discuss organ donation with their families.